The reality is, of course, much more complicated. Since their negotiations happen behind closed doors, all we can do is use what we know and speculate on the rest. My take follows. The old Maps app on the iPhone was the state of the art… in 2007. Since then, only small features were added. Remember how long it took for Street View to make it? It never received important features such as vector-based graphics (graphics that scale up and down smoothly) and driving directions. Apple wrote the app, but Google provided the dat. They had a contract between the two specifying how the data can be used. My guess is that Apple was having a hard time convincing Google to allow them to modernize the app and add features, and not the other way around. Why? 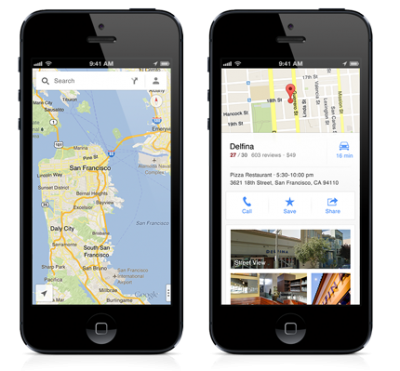 Because Google would benefit more than Apple: Android could tout a better Maps application with, yes, vector-based graphics and driving directions, among other things. But it goes both ways: Google is in the business of collecting data and using it to serve you ads. This is where their money comes from. My guess is that Google was having a hard time convincing Apple to let them better track user data, perhaps by logging in with their Google account, integrating with Latitude, serving ads. When Apple shipped the iPhone, Android didn’t exist. 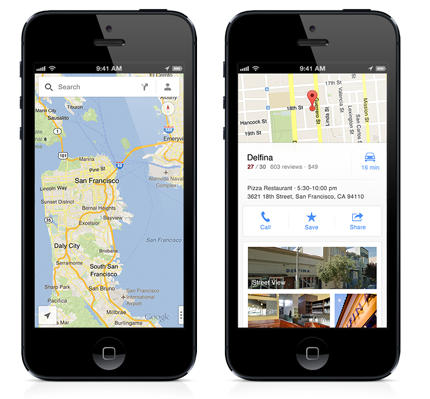 Google provides a lot of valuable online services and Apple partnered with them in order to include them: Search, YouTube, Maps. Google Maps has been out for a while, and in that time they have collected vast amounts of very accurate data. So Apple built the Maps app which used Google Maps data. Four years later, things have changed: Google developed Android with… heavy inspiration from the iPhone; and it’s giving it away to whoever wants to stick it in a phone. By doing this, Google became the most direct and fierce competitor to Apple’s main revenue and growth generating product line. Anyone following Apple in the last 15+ years knows that it has been diligently minimizing its dependency on other companies when it comes to key technologies: Apple now makes its own developer tools (XCode), browser (Safari), productivity suite (iWork), online syncing service (iCloud), just to name a few. So is a good mapping solution a key technology for a smart phone? Would it be wise of Apple to depend on its fiercest competitor on such a key technology? Apple had to develop its own in-house alternative. But the back-end just isn’t there. Building a complete and accurate database of the world is not easy. It takes years and lots of effort. And it can’t get there until millions of users are sending back reports and corrections. It’s just nearly impossible to have a great back-end database from day one. It takes time, money, effort. Anyone should have known this. But when Apple announced iOS 6 (starting at 2:06 here), it was said that the new Maps was the greatest thing ever. They shouldn’t have. They should have set people’s expectations right: “Apple Maps is the best mapping technology and once you start using it, our database will improve very rapidly”. You know how things went after this. Under-promise, over-deliver. Not the other way around. The amount of negative press Apple has received because of this has been staggering. So, did Apple unequivocally screw up and Google unequivocally won a great victory? Again, it is not that simple. Google is in the business of collecting user data in order to sell you ads. When iOS 6 came out they suddenly lost millions of very lucrative and very active iPhone users. If this had been beneficial for them, they wouldn’t have released their own Google Maps app. Apple got a terrible public opinion black-eye from this ordeal that is believed to be partially the cause for some high-level executive reshuffling. Apple shipped its Maps app. They no longer depend on a competitor for such an important piece of technology and they get the opportunity to build up and perfect the data back-end so that they can be competitive with the best: Google. Google got to release its own app which is very modern and very well designed. They can now collect all the user data they want since Apple is no longer serving as a gatekeeper. You log in using your Google account, and they are free to integrate with any Google technology (Latitude, Zagat, Ads). Expect all of this on a new version coming your way soon. And us, the users, get to choose between a new modern Apple Maps app that didn’t exist three months ago, and a new modern Google Maps app that didn’t exist three months ago. In my experience, Apple Maps works great in Austin, TX; but it was nearly worthless during my honeymoon in Southeast Asia. The data just isn’t there. Sometimes one works better than the other. I prefer the UI in Apple’s but maybe it’s because I’m more used to it. Time will tell.